When we think of tap dancing, we envision Gene Kelly and Fred Astaire, Hollywood’s golden age of dance. We think of Christmas shows, the Rockettes, and Broadway dance numbers. Tap dancing is woven through the history of art and entertainment. So why is it one of the most beloved forms of dance, and why do we at JSDA love it so much? Here are five reasons why! Tap dancing has many levels of difficulty, but even beginners can agree, this is a FUN way to get your body moving. Contrary to what some might think, tap dancing can be a very aerobic activity, and it does wonders for toning up those dancer legs! Not only does tap require skill and discipline, like other forms of dance, but it allows for unique personality in the movement, resulting in one of the most entertaining forms of dance to watch. From Ginger Rogers to Savion Glover, tap dancing has had a huge role in entertainment from its beginning. From hundreds of classic Hollywood movies, to current broadway shows, tap dance has a unique spark that enlightens audiences. We’ve established the fact that dance is good for the dancer, body, mind and soul. So how is tap dancing special in its impact? Well you might have noticed that tap is noisy, and no matter your age, making that noise just feels good and can be a big stress reliever. 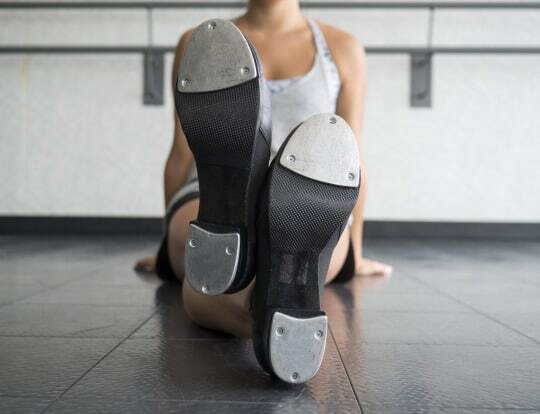 The cardio of tap is great for your heart health, and tap provides exercise for your brain with the complexity of steps and movements, which could help prevent diseases like Dementia and Alzheimers. Tap dance is a social form of dance. Although it can be performed solo, we find that many of our dancers partner up, and the tap dance community is a very friendly and loyal one—and that includes friendly competition! Tap dancers converse through the sounds their feet and bodies are making, often working together to create their own music, making this a personal form of partnership and teamwork that is unique in the dance world. In our opinion, we saved the very best for last. We LOVE this fact about tap dance, and that is that anyone can do it. Of course we know that anyone can dance, period, but the art of tap dancing focuses on technique and the use of your feet as well as individuality in your movement. It’s not a dance form that demands a particular body type or gender, we have seen famous tap dancers through history of all body types, stages and ages! There’s something extremely special about that.